In the course of loading the upcoming-events database for a belly dance troupe's web site, I've been wading through dozens of listings provided by various event organizers. And cringing with every new one I read. I have to say: we can and must do much better. I'm not suggesting that folks quit their job, get an MBA, or work on Madison Avenue. Just follow a few simple guidelines that many of us probably forgot when we graduated grade school. To that end, I've compiled a handy checklist of common listing sins. Click on the images below to see the sample posters in more detail. PHOTO CREDIT: Photo by Jason Mongue, Oakland, California. Frequently, I have to do a Google search just to find out what state an event is in. I guarantee you I care more than the customers you lose do. I just added one event to the calendar on which the venue name and address are only included as graphic elements in their online poster. I actually missed the information in the poster on my first pass and had to look closely to find it. No show time is provided at all, although I scoured the poster, thinking it was hidden in the background pattern like one of those cross-your-eyes 3D posters. The city where the event is taking place is tucked in a corner and is roughly the size of the poster artist's signature. Why make it so hard for people to find you? And if you're not in a major city, tell people what state and country your town is in, please. Personally, I'm a big fan of including a point of reference (e.g., "at the intersection of Main and Elm") in addition to just the address, but leave the door-to-door directions to your navigation system. When you list the date, include what day of the week for those of us who are calendar impaired. The big upside is that you may discover that the day and date don't jibe. Believe me, this happens all the time! 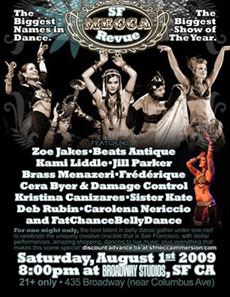 ABOUT THE IMAGE: This promotional poster was designed for the SF Mecca Revue in August 2009. This starts with using type big enough to read without bifocals and enough contrast between type and background to make the text pop. Next, format your information in a way that's easy for folks to discern. Wherever space allows, spell out words such as "Monday" (as opposed to "Mon"), "October" (as opposed to "Oct"), and "Street" (as opposed to "St"). This avoids the whole "Mon Oct 7 13" crypticness. Everyone understands "Monday, October 7th, 2013" on first glance. Write phone numbers in the old-school format of (212) 555-1212 as opposed to the terribly techy 212.555.1212. People instantly recognize that format as a phone number, and not an IP address. Help people find those most crucial nuggets (date, time, price, etc.) by bolding, coloring, and underlining them to stand out at a glance. Capitalizing proper nouns and pronouns (save the modest lower-case "i" self-reference for text messaging) makes it easier to digest information without effort. Use of basic grammar and punctuation such as capital letters at the start of sentences and periods at the ends of sentences goes a long way as well. 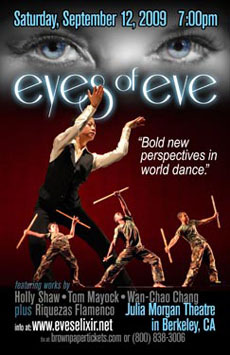 ABOUT THE PHOTO: This poster was created to promote the Eyes of Eve show in September 2009. A web page that answers everyone's questions is best. An e-mail address where someone gets back to potential audiences in a timely manner is good. Your personal cell phone number is awkward and inefficient for all involved. If you don't have enough basic answers for a web page yet, you shouldn't be promoting yet. Link directly to the event information being promoted. Don't make people treasure hunt your entire site to learn more. Too many will wander off long before finding your prize. If your site uses frames-based html code and you can't link directly to the target content, it's the perfect opportunity to quit using frames. 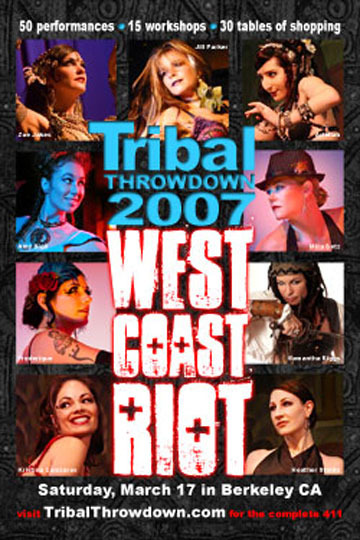 ABOUT THE PHOTO: This poster was created to promote the event Tribal Throwdown in 2007. This is a subtle detail that impacts people's confidence in you and your event, often subconsciously. If you list a time as "7:00pm" in one place, listing another time as "8 p.m." somewhere else (or worse yet, "eight o'clock") makes it seem like you don't know what you're doing. This holds for intermittent use of "and" and "&", "versus" and "vs", and random capitalization ("the Very Best music and dance"). The same holds true for punctuation. Sure, many of the arcane rules of punctuation come off as arbitrary and just fodder for tsking grammar teachers, but some of it actually helps you communicate much much better. Abuse of apostrophes and quotation marks is so rampant that there are actually web sites dedicated to documenting the embarrassing mistakes such as "Apostrophe Abuse" and "The "Blog" of "Unnecessary" Quotation Marks". A crucial but common error is the dauntingly named "compound modifier", which occurs when two words combine to describe a third word. Wikipedia's "Compound Modifier" article offers the example of "better-educated individuals" (which describes all individuals in general) versus "better educated individuals" (which could be read to be about just educated individuals specifically ). Let's avoid overusing the exclamation points, people. Using one occasionally means you're excited about a particular point. Using one at the end of every sentence weakens the impact of that one special item you actually are excited about. Using three at the end of a sentence strains credibility but could work (in a tongue-in-cheek manner) in rare cases. More than three and you sound unprofessional!!!!!!!! I'm not suggesting you lose your original voice or dry up your writing (I use parentheticals like they're going out of style!) but break style deliberately and don't give customers an obvious reason to doubt your ability to deliver. The only thing worse than thinking that potential audiences will be captivated by your oblique vagueness (the world's too full of competing messages for most folks to puzzle over your little mystery) is the gift of gab. Sometimes it's more a matter of organization. You have to intuit where readers are going to look for specific information and make sure to deliver what they want, where they expect to find it. But more often, writers are simply too long winded.
) We must mercilessly hack out clichés and fillers (for example, "in order to" and "designed as"). We must purge modifiers for weak words (It's not "very big", it's "huge"). We must obliterate repetition. We must obliterate repetit... Well, you get the picture. In my experience, most writing can be condensed by 50% or more without losing any of its information, flavor, or impact. In fact, impact is dramatically improved with concerted editing. A real-world example came up online where a dancer seeking feedback had written, "I will continue adding additional information on a regular basis... " on the front page of her site. This is a text-book example of how passive voice, cliché, and redundancy combine to hurt brevity. "I regularly add information..." says the same thing in less than half the word count. While I don't claim to be Strunk nor White, I believe Shakespeare when he said, "Brevity is the soul of wit." He did okay as a writer. Although, at this point, I've rambled on so long that I've probably already violated that last call for brevity altogether. Sure, everyone has the occasional typo, but always have a second set of eyes proofread any materials that speak for the brand before they go public. Thanks for your patience. Now let's make better blurbs. ABOUT THE PHOTO: This poster promotes an event in Barcelona. 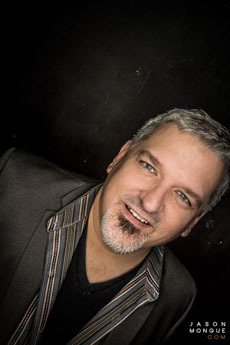 Brad has produced and co-produced major events, including Unmata's annual Blood Moon Regale, the national Spark Tour (featuring Urban Tribal and Ultra Gypsy), the San Francisco Mecca Revue, the Tribal Throwdown festival, all 4 years of Undulation shows, the Nouveau Nights series of shows, and the long-running Kosmos music and dance camp. He has been a judge for the Breakthrough Fusion Dance Competition. 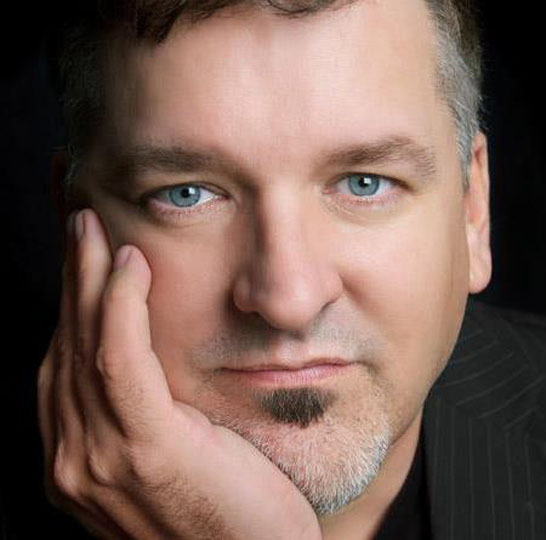 Brad has worked with artists including Rachel Brice, Ansuya, Heather Stants, Amy Sigil, Zoe Jakes, Ariellah, Kami Liddle, Jill Parker, Cera Byer and more on original photography and design. 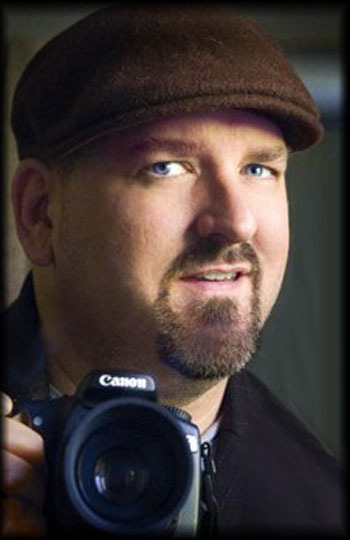 However, most people know his work photographing performances such as Tribal Fest, ShadowDance, Tribal Massive, Las Vegas Bellydance Intensive, and countless sets at afterparties and more intimate venues. PHOTO CREDIT: Photo by Kristine Adams, San Francisco, California. Working with News Reporters. By Christine. Read this before you send out a press release or schedule an interview with a news reporter! Marketing Yourself as a Dancer. Introduction to the basics of marketing.